As every mother knows, children can be a frustrating mixture of creativity and pure stubbornness. Nowhere is this more obvious than in their choice of food. Whilst they can have hours of fun with just a cardboard box, using it as a car or a house, when it comes to food, they are usually pretty set on what they do and don’t like, and in most cases, what they do like is sweetness. This can be of concern to the mother who, whilst wanting her child to enjoy sweets, also wants them to grow up eating healthily. 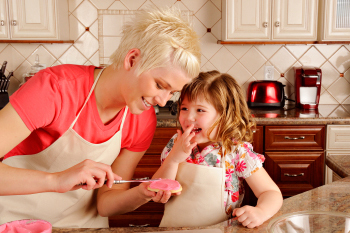 One way in which this can be encouraged is by involving children in the cooking process. Whilst it is unlikely that this will get them eating the dreaded broccoli overnight, it will set off the process of curiosity about how food is cooked and what can be done with it, and will open their eyes to the possibilities of making food both interesting and delicious. Naturally, there is no point in starting them off on what they will most likely consider to be uninteresting foods; i.e. vegetables; it is perhaps best to start by involving them in the cooking of things that they do like such as deserts. An easy recipe to start with, but one which is delicious for both adults and children alike is lemon drizzle cake. Naturally, children should not be allowed near the hot oven that is needed to bake the cake, but they can get fully involved in the mixing of the ingredients and the decoration of the cake. Those of us old enough to remember the time when cakes were made at home rather than bought will no doubt fondly remember the warmth and aroma of the kitchen as our mothers baked the cake, and without a doubt, the highlight for the children was the licking of the mixing spoon, something which many children are denied the pleasure of now. Do make sure when you make this cake to provide plenty of extra space to give your child the freedom to make a bit of a mess when mixing the ingredients; remember, it is supposed to be fun as well as educational for them. Once they have mixed the ingredients, it is time for mother to take over and put the cake into the oven for about 3-4 hours. It is probably a good idea during this period to let the children play whilst you tidy up the area, it will probably take that long! Once the cake has cooled to room temperature, it is time to mix the topping ingredients together and decorate the cake. Whilst zigzag lines are the traditional decoration for this cake, there are no rules and by giving the children free reign, they are more likely to enjoy doing it and even if it is a mess, they will have had a great time and it will still taste great too. There are no guarantees that this experience will get them to eat vegetables or homemade fish fingers the next time out, but you can be sure that you have set them off on a road of discovery about food; one that means they will be keen to discover new foods for themselves and you get to eat some delicious cake in the process too. Lorcan Delaney is a writer for a number of food blogs. He has also worked on a number of women’s blogs and is a parent and understands the struggle.